Food • Company says it has taken a substantial hit from backlash against ammonia-treated filler. Lubbock, Texas • The maker of "pink slime" suspended operations Monday at all but one plant where the beef ingredient is made, acknowledging recent public uproar over the product has cost the company business. Craig Letch, director of food quality and assurance for Beef Products Inc., declined to discuss financial details. But he said business has taken a "substantial" hit since social media exploded with worry over the ammonia-treated filler and an online petition seeking its ouster from schools drew hundreds of thousands of supporters. The U.S. Department of Agriculture has decided school districts may stop using it, and some retail chains have pulled products containing it from their shelves. Federal regulators say the product, which has been used for years and is known in the industry as "lean, finely textured beef," meets food safety standards. But critics call the product an unappetizing example of industrialized food production. Beef Products will suspend operations at plants in Amarillo, Texas; Garden City, Kan.; and Waterloo, Iowa, Letch said. About 200 employees at each of the three plants will get full salary and benefits for 60 days during the suspension. The company's plant at its Dakota Dunes, S.D., headquarters will continue operations. The company, meanwhile, will develop a strategy for rebuilding business and addressing what Letch called misconceptions about the beef the company makes. "We feel like when people can start to understand the truth and reality then our business will come back," he said. "It's 100 percent beef." The company last week took out a full-page ad in The Wall Street Journal defending its product. It also launched a website, http://beefisbeef.com , which Letch says will help dispel myths about pink slime  a term coined by a federal microbiologist grossed out by it and now widely used by critics and food activists. The lower-cost ingredient is made from fatty bits of meat left over from other cuts. The bits are heated and spun to remove most of the fat. The lean mix then is compressed into blocks for use in ground meat. The product is exposed to ammonium hydroxide gas to kill bacteria, such as E. coli and salmonella. "At a time when so many Americans struggle to put a healthy, nutritious meal on their family's dinner table, the unfounded mischaracterization of Lean Finely Textured Beef as 'pink slime' is unconscionable," Barry Carpenter, CEO of the National Meat Association, said in a Monday statement. "I am sure the public is not aware of how widespread and potentially devastating the consequences of allowing public misperception to trump sound nutritional science are." But Marion Nestle, a professor at New York University's Department of Nutrition, Food Studies and Public Health, said there are other considerations. "If this is acceptable to people it essentially means it's OK to eat the kind of stuff we put into pet food," she said. "Culturally we don't eat byproducts of human food production. It's not in our culture. Other cultures do. We don't." The beef product made headlines last year also after McDonald's and other major chains discontinued their use of ammonia-treated beef. 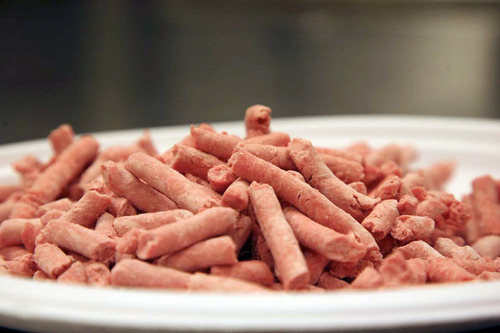 Other processors make similar "lean beef trimmings" for inclusion in ground beef that are instead treated by citric acid. There are no precise numbers on how often the ammonia-treated product is used and it does not have to be labeled as an ingredient. Past estimates have ranged as high as 70 percent; one industry official has estimated it is in at least half of the ground meat and burgers in the United States. Beef Products' plant in Amarillo produced about 200,000 pounds a day, while the Kansas and Iowa plants each produced about 350,000 pounds a day.